What is simplicity & why should you care? Simplicity is well-used buzzword today. Although there may be some basic tenets of the philosophy or lifestyle, the spectrum of its meaning is broad. There are also different shades of simplicity, such as minimalism. I want to explain a few key points about my experience and definition of simplicity, or simplicity living. First, simplicity is two-fold: It is the pruning of unnecessary possessions, commitments, and activities in our lives to increase space for the things of highest value (family, community, faith etc.). The practical expression of simplicity is unique to each individual and his or her values. For one person simplicity might include elimination of TV programming, for another downsizing a home, for another declining outside commitments. The practice of simplicity is not always dramatic. Sometimes it’s subtle and includes small acts such as reducing your book collection or donating duplicate cooking tools. First impressions of simplicity often include images of drab empty homes, sullen faces and cloistered families who reject mainstream culture. Simplicity is not a state of barrenness! Second, simplicity living is a state of fullness, not deprivation! It is prioritizing the most satisfying and rich parts of life above the parts that detract from contentment. From a young age, American media trains us that abundance or abundant living is found in possessions: The more you own or possess the more abundant and full your life. Simplicity involves a reeducation of the heart and mind. Like any worthwhile pursuit, there are challenges, but the fruit of contentment is worth the effort. Third, simplicity is the process. The fruit is greater contentment, joy, and fulfillment. I will write more on contentment as part of the 31 day writing challenge. I am anxious to share several simplicity triumphs to demonstrate the freedom and fulfillment of simplicity. And always – I would love to hear your stories! I encourage you to read Not More, Better from Joshua Becker at Living Minimalist, one blog fomenting my simplicity pursuit. Welcome to my answer to the Nester’s 31-day writing challenge – Almost Simple Enough. Many of you have seen snippets of my simplicity journey and I aim to share more during the month of October. I admit the small challenge of writing even a few lines for 31 straight days seems daunting to me. Like many of you, I stumble daily along my journey as a mother, wife, worker, friend, who has aspirations, doubts and chronic health struggles. 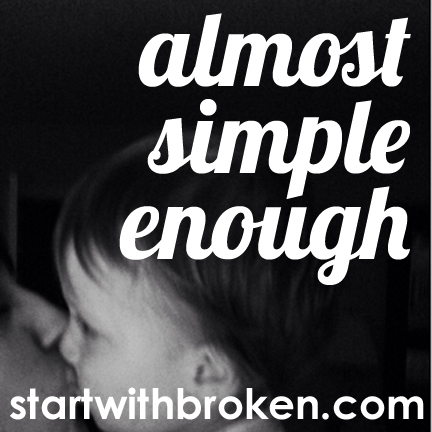 For the background story on why I chose to pursue greater simplicity, read Start with Broken. Look for photos, tips, lists, anecdotes and experiences this month on increasing the simplicity and contentment in life. 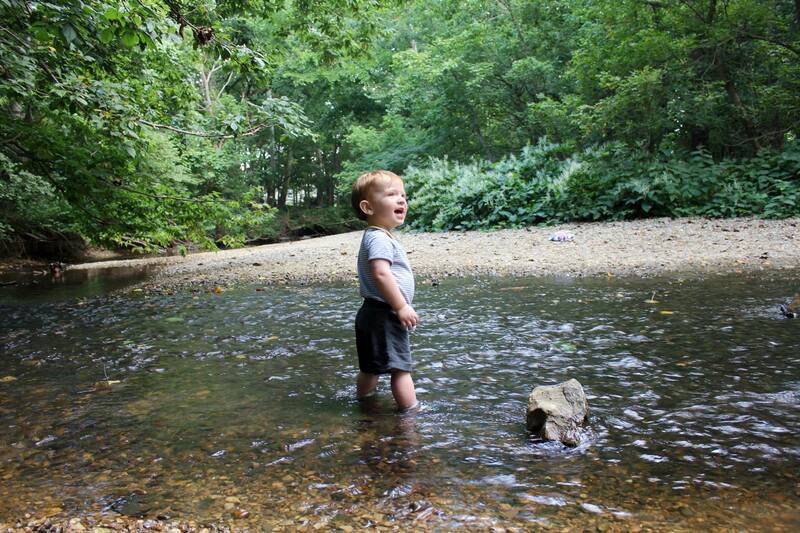 Look for two themes in my experience – the pruning my toddler son provides and the contentment only God can offer. I look forward to your comments and experiences as well. Many of you are walking a similar journey! Why – Start With Broken ? Pretend we just met. Maybe we experienced a natural connection or maybe our conversation was unpleasantly awkward. Regardless of the outcome, I want you to leave the encounter thinking I can do it all. I want you to think I’m like the woman you read about once in a magazine – the one who rises before her husband and children for a morning run, followed by harvesting in the garden, then washing up to cook a breakfast of local eggs, hand-squeezed orange juice and heirloom fruit, all while writing a narrative poem that she will read to her family while they eat. The description seems ridiculous, right? Unfortunately, I pursued this lie of doing-it-all until my body no longer allowed it. Years ago, someone called me a “renaissance woman.” At the time, it seemed the most significant accolade of my adult life. Being type-A, I took much pride in the compliment. My drive to do was fueled by a desire to make others believe I could do it all. Managing my life was exhausting – friends, family, church, hobbies, news, work, fitness. The flow of things to do or know was relentless. But admitting that I had physical and emotional limits seemed a submission to failure, so I pushed on, concealing myself with projects and activities. I believed if I stopped to rest, I would become ordinary, unremarkable. 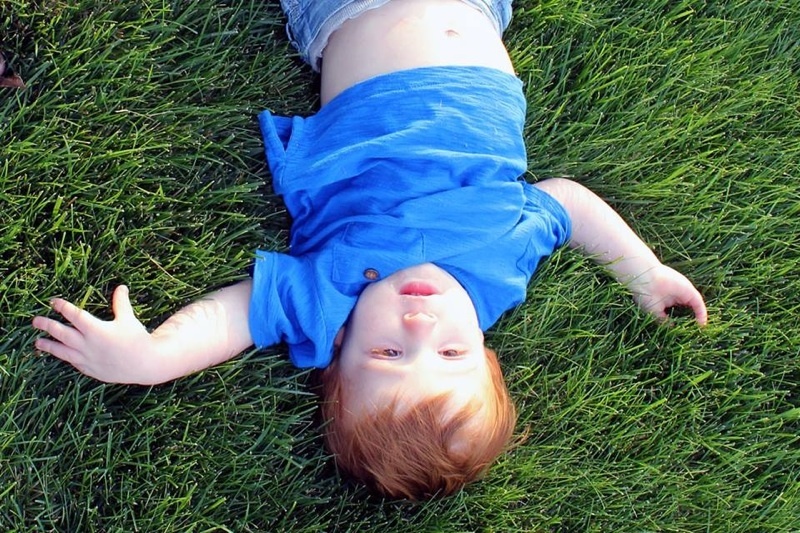 Attached to our childless lifestyle, my husband and I waited 8 years to have a baby. I convinced myself I was finally ready for a child to rearrange my life. Secretly though, I hoped for a life not too different from the one I was living. I assumed I would find a way to do it all, only now with a baby at my side. Scanning the blogs of crafty young mothers only confirmed it must be possible. Believing the lie, I was clueless to the impact my son would have on my life, or to the journey ahead of me. An extremely sick pregnancy took me by surprise. Every day was a great struggle. Gradually I was forced to surrender my life one activity at a time – hobbies, household projects, even a few relationships. Rest was the only activity within my capacity. Working and completing the simple tasks of each day seemed insurmountable. Sometimes I laid on the floor of my office in the fetal position just to make it through the day. The surrender continued following birth as infection and a complicated recovery followed my caesarian section. In the midst of it all, I fell deeply in love with my son. My longing to be near him helped me accept the slowing of my life as a gift. Raising a child decreases one’s margins. To a larger degree than many of my friends, my body enforces its limits. I could resent these limits, but the truth is without them, I would be a ship run aground by impulse. Physical brokenness is an integral part of my person. It is the discipline that precedes simplicity. When I eventually returned to my baseline months later, the old impulses returned – “Try this project! Rejoin the media stream! Get back in touch with so-and-so!” Unlike in the past, I was now able to deflect these impulses. I had tasted simplicity. A year of physical brokenness released me from a fear of the ordinary and taught me that simplicity living creates more room for the real stuff of life. God created a work of beauty from the sickness, darkest months of my life – another of his “beauty from ashes” narratives. What I learned is that the most delightful, the most heartbreaking, the most fantastic, is in the ordinary. Watching my son, I sense an importance in every moment – that right here, on the floor, in the long evening shadows, is a moment of influence I will never replicate. How humbled I am, knowing I could have missed these moments because of my own pride. But what does the idea of simplicity mean practically? It means I give my family the first portion of my energy. Unlike before parenthood, I keep my commitments few. I do not pursue multiple projects or involvements, and I filter the relentless stream of ideas and news. Post-Pinterest-traumatic-stress anyone? I have stopped trying to prove I can do it all. If I forget my simpler priorities, my body reminds me. I admit there are days where the impulse to dive into activity is strong. I imagine my son as a young man and fear my accomplishments and activities might not be enough to make him proud of me. In those moments, I reject fear and trust he will be most proud of the mother who loved well and gave generously of her presence above all else. In contrast to “renaissance woman,” I now hope to be label as present, engaged in the moment. I am held accountable knowing my son will not learn to value what’s most important unless I model it myself. Choosing simplicity has shifted my values and changed how I prioritize the different components of my family’s lives. My goal for a day is no longer a lengthy project list. The primary objective is to be present with my son. I look him full in the face and listen, not ruminating on projects left undone or darting between his requests and my cell phone. I allow the flow of the day to lead us. We walk outside, we build, we tear down, we take lazy baths and bike rides, we bang pots and pans, we dance to a record, we read a stack of books, we nap, we jump on pillows, we take blanket rides around the house. I simplify our schedules and our home so we have greater freedom to engage with each other – less toys, less noise, fewer commitments. In quiet moments I imagine life without my son and the work God is doing through him. The image always moves me to gratefulness – how much I almost missed! To others experiencing physical brokenness – let it be a simplifying force in your life. Brokenness is a turning point, a preface. It is the point on the long drive where you make the final turn to see home ahead, sweet in firm but few expectations, simple, but generous in space and time, ordinary, but one of a kind. 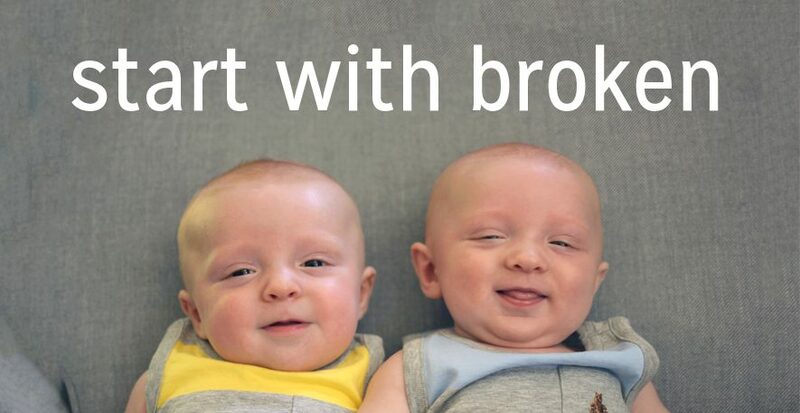 Why start with broken? Because its the place where transformation begins.